December has been colder than in recent times and we've had not a few chilly, white-world frosty mornings of late. 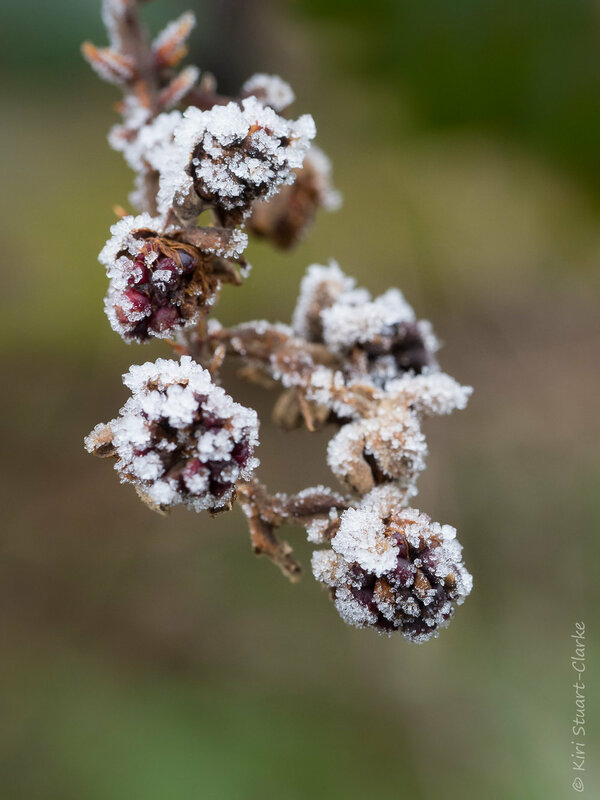 Hoar frosts have always held a special place in my heart as they always take me right back to fond memories of frozen winter wonderland walks up on the Ridgeway back in Letcombe Regis, but what makes a Hoar frost so special? A Hoar frost, also known as hoarfrost, pruina or radiation frost, occurs on cold, clear nights with humid air when a dew would form if it were warmer. In a Hoar frost, leaves, grass, branches and other objects cool by radiation to well below frost point, allowing water vapour to condense directly in the form of ice crystal deposits rather than in the form of water droplets first. A normal White frost or Ground frost is caused when water vapour from the air forms a liquid dew first and then freezes with a subsequent drop in temperature, so tends to be more globluar in shape rather than feathery or crystalline. Fog tends to inhibit Hoar frosts as it prevents radiation cooling, however can create Rime, which is an ice deposit formed from supercooled fog vapour that crystallised when it touches a frozen object.